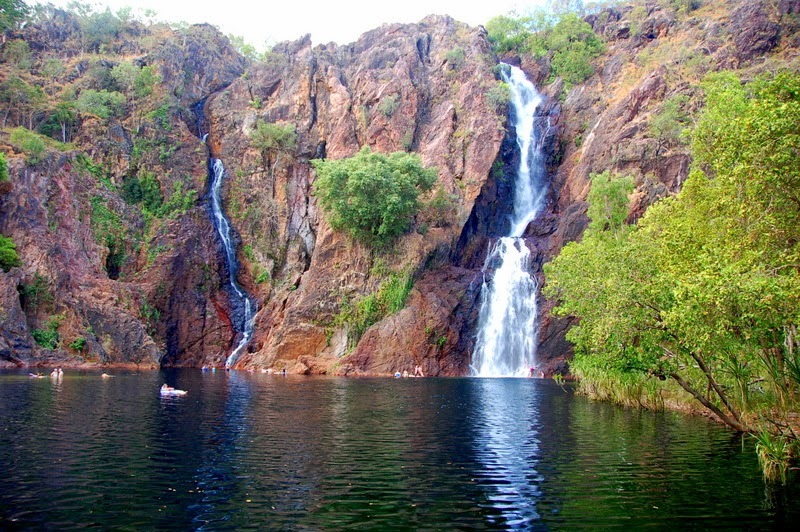 Litchfield National Park is 260 km from Katherine, going northeast back up toward the coast. Finding the park wasn't entirely difficult. Sandor drove and Thea did the navigating. "Drive straight for 236 km and turn right." she said. And then she went to sleep. She didn't stay asleep, poor darling. The handbook of our trusty van swore up and down that the thing could hit 130 km/hour on the straight. But it had no cruise control. Sandor desperately wanted to put the van through its paces on the long straight road, but a van weighed down by five adults, one baby, four metric tons of luggage, and a picnic hamper full of hamburger fixings accelerates like a turtle in a particularly sucking mud. He'd mash his foot onto the accelerator, and the little engine would whine and wheeze a little in complaint, and slowly, ponderously, bucking a little as it crossed through the round numbers, the speedometer needle would drift up toward the red, and five or six kilometers later, when we were pushing 110 on the flat, we'd run into a road-block or a road-train, and he'd have to slam on the breaks and slow right back down again to zero until we were allowed to pass. By the time Sandor had turned right through the gates of Litchfield and found some swoopy curves to play with on a long descent down an escarpment, our very own grand-prix racing driver had 236 km of frustration under his accelerator pedal and he was ready to roar. Except that top-heavy camping vans tend to wobble when you play grand prix on hairpin bends. And the people in the back seats don't think very much of it. Including and particularly the Sproglet. The shearing songs had to come out again. By the time we reached Litchfield National Park, we'd had about enough of driving places. We wanted to stay in one place and go swimming. But first we had to stop and gawp at the termite mounds. There are thousands of them, adobe arcologies like standing stones, like soldiers in serried ranks standing at attention facing north, a million termites in each one. The Top End's 'magnetic' termite mounds are a mystery. It's a miracle of nature - that the termites know the orient direction for the best sun and wind and ways to brace against the monsoon rain - a phenomenon of a billion termites with compasses inside their heads. This story-book version, park signboards told us, has been lately and largely disproved. The truth is less a miracle of nature than direct Darwinian intervention. Termites build every which way, and the mounds that aren't built to precisely the right specs don't make it tall enough to be noticed before they fall down and blow away. It's the three little Pigs as a morality play - straw and sticks are east and west, and bricks built to north and south keep out all the huffing and puffing that the big bad wolves can throw. It's not half as mythic this way. This way, romance doesn't throb in your veins at all. And it was hot. Blisteringly hot. We had our photos taken with the termite mounds and we went to Wangi Falls instead, and ate our picnic lunch on a blanket on a lawn, with a pair of black cockatoos peeling the bark off of a tree above our heads. Wangi Falls was bright with sun and loud with shouts ringing off the rocks. The falls are only 80 km from Darwin, and very very popular with locals who choose not to swim in salt-water-crocodile-infested oceans. There was a path to the top of the falls, but the climb took an hour and had no view of the water below. "Sod that," we said. It didn't appear hugely popular with anyone else either. The pool at the bottom of the fall has fish - if we'd brought swimming goggles and a snorkel to see them with. We hadn't, so we stood on a bridge over the little creek that ran out of the swimming hole and watched little fish quivering there, lined up in rows like the termite mounds, oriented parallel to the current, heads upstream. And then we went swimming. There are freshwater crocodiles in the swimming hole, but the Parks Service is vigilant, and pitches out all but the baby ones that are as small as the fish in the pool and far too sensible to take a toothy chomp out of a toe. In the pool, the best sport was to swim up to the main waterfall - curving around sideways to avoid the current, and climb up the rocks as high as you dared go, then clinging crabwise to the wall, work your way into the waterfall itself until, just when the current tore you loose, throw yourself out into the pool and be spun and dragged half-way across before the current slacked. Mr Tabubil came out of the water after an hour, and sat on the grass in the sun with the Sproglet. The rest of us stayed in the pool all afternoon, until the sun started to drop behind the cliff and the air turned cool. And the world was very good.